JO Hinomaru Bento is the enhanced version of Hinomaru Bento. Newly added raw material (proteinaceous plant fermentation) helps improves intestinal activities. Carotenoids such as lutein and zeaxanthin reduces the body color deterioration in the growth phase. JO Hinomaru Bento contains Phospholipid, which is a very important nutritional source for crustacean. It is an essential constituent for ovarian maturation and is known as the energy to utilize for growth induction and molting. It also contains Animal cholesterol which crustacean cannot generate in the body and must ingest from outside. The ingestion of cholesterol allows a molting hormone secretion and generation of vitamin D6, which stimulate the ecdysis behavior. This product also contains mineral element such as calcium, which prevents molting failure by the effect of cholesterol and mineral. Our experimental test shows that no molting failure can be seen if no mineral additive agent is added to aquarium. What matter to fresh-water crustacean, are quantity of minerals retained in the body and cholesterol as a precursor of molting hormone. We consider underwater mineral is something extra.. Vitamin C & DHA are elements to be used significantly for crustacean. These are said to be effective for the tolerance of stress, especially for the heat tolerance. It is difficult for the crustacean living in water to ingest water-soluble vitamin C more than 90% of which shall be lost during heat procedure if added to the food. Furthermore, the vitamin C remaining in the diet will be lost with time (one month). As this product contains APM which is less susceptible to heat, vitamin C can be detained as much as possible in the food.. Chlorella is 1/100 size of spirulina, a natural food source that contains an unusually high amount of protein which microbes eat, "Hinomaru Bento" adopted "the fresh water chlorella" which was the best for "bee shrimp". Another important ingredient is the SG (Shrimp Guard), which is a special supplement for crustacean developed by Kyushu Medical. This is a product aimed at improving resistance to crustecean infection.. Through our experimental tests carried out for all crustecean species, this product is proved to be effective for infectious disorder. However the mechanism on how the resistance improves are unexplained yet. Once this product was introduced, Shrimp Guard would lead to higher blood level for 5 to 7 days. 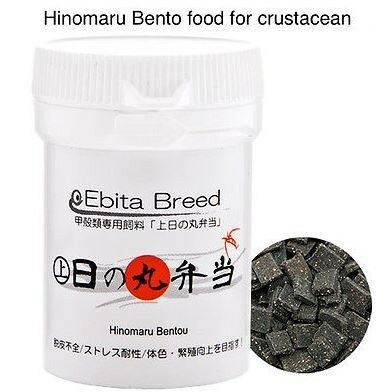 Available for crustacean such as bee shrimp, neocaridina denticuata and caridina japonica and shellfish such as ram’s horn. Ingredient: Phospholipid, Animal cholesterol, Vitamin C & DHA, Fresh water chlorella, Shrimp Guard, etc. Instruction: ☆ Feed within 4 months upon opening the packaging. ☆ Crush the grains into small pieces for smaller shrimps. ☆ Remove any residual food after feeding. ☆ Keep the product in a cool, dry and dark place.